Spotify Holiday Playlists - Get into the Christmas spirit! - All Chucked Up! You are Here >> Home >> Featured >> Spotify Holiday Playlists – Get into the Christmas spirit! We Filipinos are a people that love Christmas time a whole lot. In fact, we celebrate this wonderful season the longest compared to other countries. When the “ber” months start creeping in, houses and streets are immediately adorned with lights and lanterns to signify the start of this most anticipated part of the year. You could also immediately hear Christmas songs playing on the radio and inside malls. There’s just something about Christmas songs that uplift our spirits and gives us that certain warm fuzzy feeling. I enjoy listening to Christmas tunes and yuletide carols as much as the next guy. That’s why I’ve packed my Spotify app with a good number of their recently launched Spotify Holiday Playlists. It’s a sure fire way to get anyone into that merry mood. There are lots of Spotify Holiday Playlists to choose from… all you have to do is (on your Spotify app) click on “Browse” and head over to the “Happy Holidays” genre. 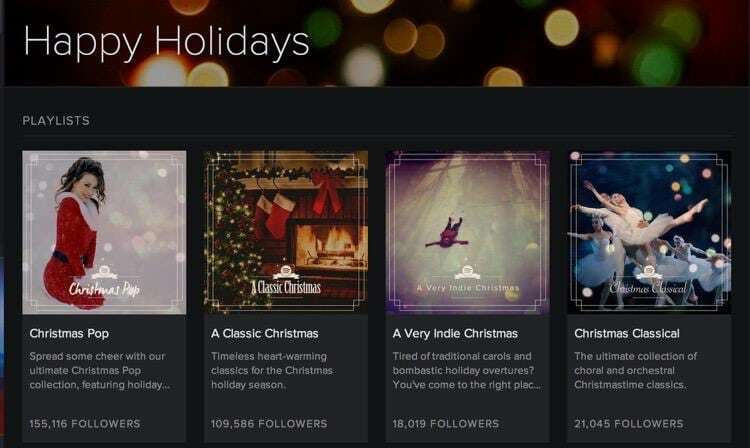 There you will be able to choose from a wide selection of Spotify Holiday Playlists such as A Classic Christmas, A Very Indie Christmas, Christmas Magic, Acoustic Christmas, Contemporary Christmas, and a whole lot more. 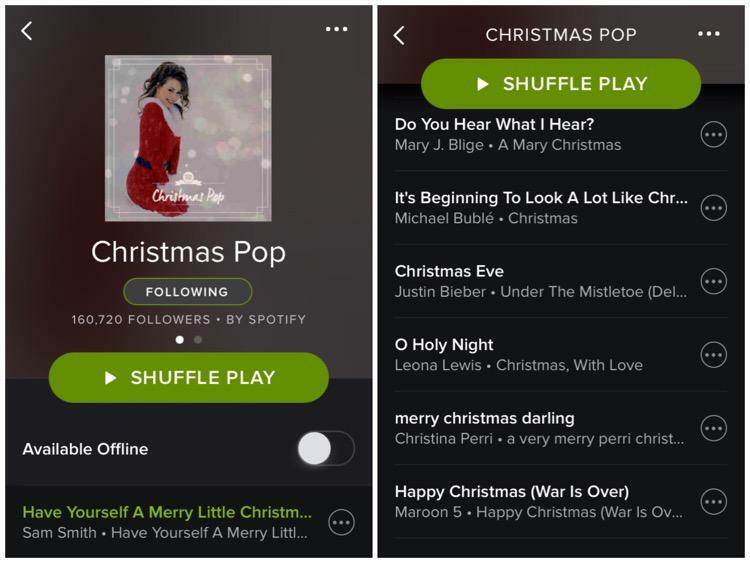 If you’re still undecided as to which of the Spotify Holiday Playlists you’d like to save and listen to, I highly recommend “Christmas Pop”. Classic meets modern in a way that just makes old Christmas favorites sound like new again. Get to enjoy familiar Holiday songs like “Have Yourself A Merry Little Christmas” or “It’s Beginning To Look A Lot Like Christmas” by current pop artists such as Sam Smith, Ariana Grande, Maroon 5 and Meghan Trainor. You can’t go wrong with “Christmas Pop”, really! Young ones will be able to easily sing along to the tunes and appreciate the artists performing them, while older folks will love the fresh take on old familiar songs. But hey… don’t choose just one playlist. Grab a bunch of Spotify Holiday Playlists and play them back one after another. 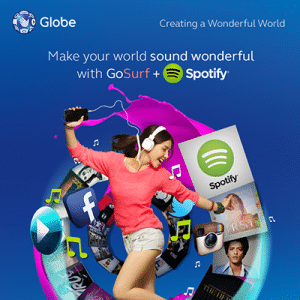 Did you know that you can easily upgrade your basic Spotify account to Premium by subscribing to any of Globe’s incredible GoSURF plans? It’s awesome! Apart from that, data streamed from Spotify won’t eat up on your GoSURF’s allocated monthly data. If you aren’t on a Globe GoSURF plan yet, I encourage you to subscribe and join in on the fun. Not on Globe GoSURF? No problem. You can effortlessly upgrade to Spotify Premium by charging it to your Globe Prepaid Load or Globe Postpaid Bill (for Android) and GCash AmEx (for iOS). So, spread the holiday cheer with friends and family and share that wonderful Christmas spirit by playing some of your Spotify Holiday Playlists at home and even on the road. Share some of that delicious steaming hot chocolate and quezo de bola while you’re at it. Perfect! Merry Christmas, everyone! May the joy and laughter you share with loved ones this holiday season be as unlimited and uninterrupted as Globe’s GoSURF plans and as abundant as the number of songs in Spotify Holiday Playlists. ‹ Globe Tattoo x NBA Cares Basketball Clinic with Richard “Rip” Hamilton › Fisher Farms Gourmet Baked Rellenong Bangus – Healthy and Hassle-Free!